In Buddhism, Mahaparinirvana is a term meaning «great, complete Nirvana«. The word «Mahaparinirvana» usually refers to the ultimate state of Nirvana (everlasting, highest peace and happiness) entered by an Awakened Being (Buddha) or «arhat» at the moment of physical death; but it can also refer to that same state reached during such a being’s physical lifetime too. 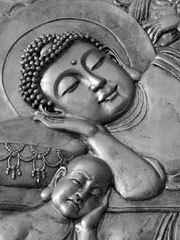 In the Mahayana Buddhist scripture entitled the «Mahayana Mahaparinirvana Sutra«, the Buddha teaches that unlike «ordinary» Nirvana, «Mahaparinirvana» is the highest state or realm realised by a perfect Buddha, a state in which that Buddhic being awakens to «the Eternal, Bliss, the Self, and the Pure». Only in Mahaparinirvana is this True Self («atman») of the Buddha said to be fully discernible.